Choose among three different methods for entering the quantity to order in stock management: Ask, Quick Scan and Suggested Quick Scan. Add pictures of an item, as well as a comment, in the stock management panel. You can then view the pictures in the LS Central store inventory worksheet. Display sales information when scanning an item window. LS Retail partners can customize the type of information that is displayed, depending on each retailer’s requirements. Use Units of Measure (UOM) set on items’ barcodes instead of the base UOM from the retail item card. In this release, we have enriched the mobile POS with new functionality. You can now format the receipts that are printed on the mobile printer, and add to them your business logo and barcode. This can be done in the LS Central back office. We have also added a new EFT plugin to the mobile POS, Adyen. It is now simpler than ever for users to select and configure plugins for LS Pay at the Hardware Station. On top of adding added a new, intuitive process, in this release we have also introduced two new LS Pay plugins: AltaPay tcp/ip and Adyen Cloud. 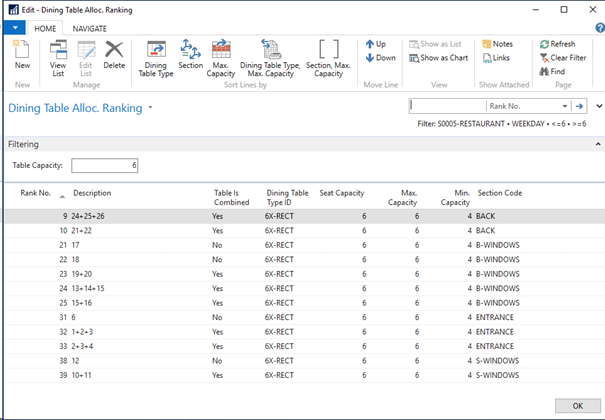 In this release, we introduce more sophisticated ways to plan your restaurant capacity and manage table reservations and walk-ins. You can now fully manage your restaurant capacity and layout for any specific date and time in the future. 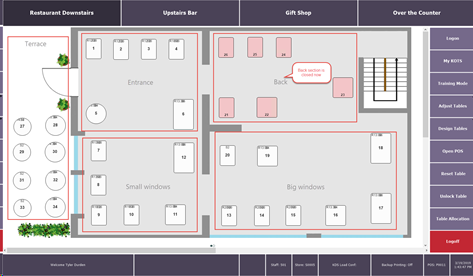 Set up sections and decide when they are open or closed in the new Dining Area Plan that is set up for each dining area in your restaurant. Your setup is reflected on the POS. 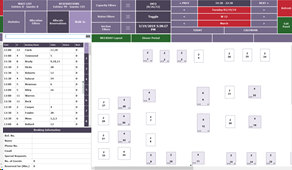 For example, in the image below you can see that, in the Table Operation Screen, tables within the back section are shown as disabled. You can also see which tables are active and which are disabled in the Table Allocation panel. You can now create dining reservations using the LS Activity add-on. 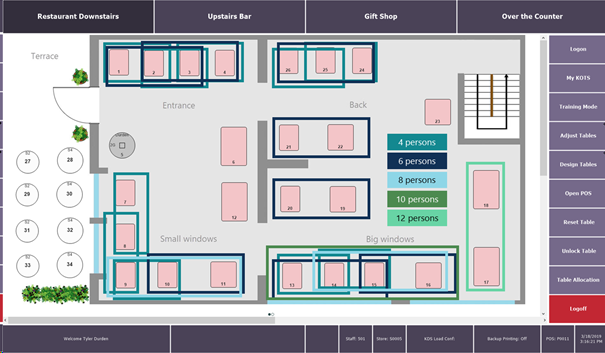 For now, the restaurant capacity is set manually in LS Activity, but in the near future the reservation engine will use the capacity for each period as set in the restaurant plan. Walk-ins (customers who are assigned a table without having a booking) are still created directly in the allocation panel. 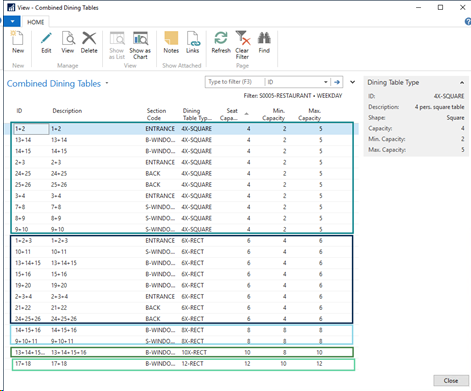 To optimize table allocation, you can now easily combine dining tables. For example, Table 1 (for 2 people) and Table 2 (for 4 people) can be combined to form Table C1 (for 6 people). The system will then allow you to allocate a reservation for 6 persons to Table C1. Dining tables, both single and combined, can also be ranked. This means you could decide to allocate all tables next to the window first when taking reservations. 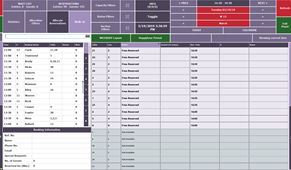 In the image below, you can see how tables with capacity for 6 (both real tables and table combinations) are ranked in the system. In this example, the table combination of tables 24+25+26 will be the first to be allocated, if available. 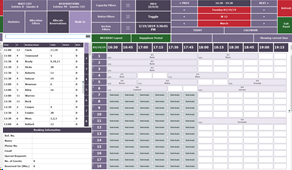 Timeline view (default) – See the dining tables in a matrix showing table status for a specific time interval during a day. 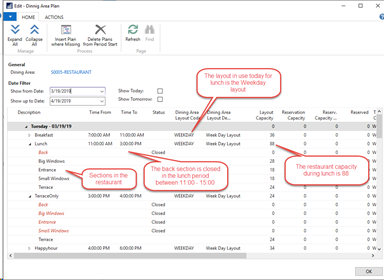 Graphical view – See the graphical layout of dining tables and their status at the start of the selected time range. List view – See a list of dining tables, with status at the start of the selected time range. All these views can be filtered by capacity, section and status, and you can scroll across time periods. A new, powerful search engine enables you to find information across multiple fields within your reservation list. This means you can quickly find customer reservations using names, phone numbers, and more. 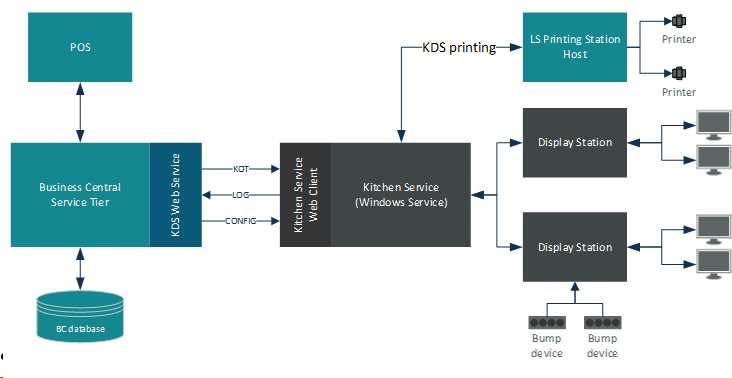 In this release we introduce web services as the new communication framework between LS Central and the Kitchen Display System (KDS). All logging from KDS to LS Central also takes place through these web services. This replaces the NAS service that was used until now. In this release, we introduce new functionality within LS Activity, our event and reservation software add-on for LS Central. With Member Deposit Management you can keep track of member deposits, which can be used as payment at Point of Sale. When the balance is used as payment, you can now show the leftover balance on the receipt. Learn more about this functionality in this explanatory video. The all-new subscription charge adjustments lets you create charge adjustments, instead of creating a credit invoice and a refund, for members who have been overcharged in the past. This charge adjustment is then deducted from the regular member subscription charges in the next membership invoice. You can learn more about this functionality in this explanatory video. In this release we have simplified your overview of rental items that are currently out. You can also now select a specific unit, and assign it to be returned. We have alos simplified the process of searching among rental reservations. You can now set attributes as fixed fields for reservations, activities, products, resources and rental units. This means you can filter by attribute, as well as edit attributes in the card view. You can now add the URL of the LS Central POS in the LS Central App in two different ways. We have added a new settings screen where you can enter the URL in parts. Otherwise, you can continue to enter it directly in one string as you have always done before. Would you like to know more about the LS Retail software solutions? Are you curious about what is coming up in the LS Central roadmap? Then join us at our conference and expo conneXion in Munich, Germany, on April 3-4, 2019. You can attend product-focused sessions, get technical in the workshops, discover the hottest retail and technology trends, and get one-on-one conversations with the LS Retail experts. Register now!